there almost at the end? Legend has it a little girl once climbed this tree. 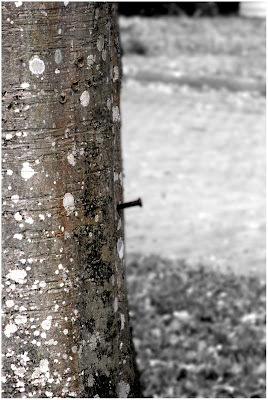 Whether it is true or not I cannot say, but the nails are there, really screws I think, and have been there for as long as I have known this tree. They are temptations, daring you to clamber on up and find a spot, a bird's eye view, among the branches. Summer would be best, hidden among the leaves, and I know a bird or two who would stop by for a secluded visit. Do children still climb trees, or is that now a wii game, virtual trees waiting out there, or in there, for them? This past weekend I watched my niece climb atop her bricked in mailbox, despite the age of 13 waiting in the wings, up the 4 feet or so and and then a dance of joy at being just that far up, a face full of uncontained happiness, laughter at the cold air, the cold sunshine, so maybe tree climbing is not yet a lost art. I am sure she would be up those nails in a heartbeat; in fact I now recall stopping her from doing just that when she was 4 or 5. A book to read: The Wild Trees. I'll give it to her later. Beautiful!! I do fear that the magic of climbing trees has begun to fade :( If only the children in this generation new the wonderful world that lay within the branches!! i used to love to climb trees. virtual trees as a wii game - that's hilarious but sad to think. and now well, I am thinking I really must get over there and CLIMB one for what was I thinking? climbing? basics? too many things left behind..
Oh yes - children still climb trees. No wii game will ever replace that sense of joyous freedom. Love your words acccompanied by this image. Oh yes, there are magical memories of tree climbing from my childhood, and even though it makes me shudder, I love to see my son climb. I am very interested in this book, must check it out. Have you read the Golden Spruce? Why is it that kids are allowed to do things that would make us adults look silly if we did them? I sometimes watch kids skipping and hopping about, sometimes twirling, sometimes singing out loud and wonder what made adults so *grown up* (grrrrr) that we can't do those things just as freely without being looked at as though we are off our rocker? It really isn't fair.